Since 1999, Microsoft PlayReady Content Protection has been the most trusted DRM technology by studios and content owners. Devices using PlayReady Software based implementations are approved for 720p and 1080p content. As the industry moves beyond HD, introducing full 1080p, UHD, 4K and higher resolutions, as well as early window content, Microsoft recognized the need for a higher level of content security, and evolved its hardware based DRM to address content owners' requirements. Through close collaboration with various stakeholders in the media industry, Microsoft released a new version of the PlayReady product suite as well as a new governance model to address these challenges. The latest versions of the PlayReady Porting Kit (PK) are designed to optimize the integration of PlayReady into any kind of Trusted Execution Environment (TEE) to satisfy hardware security requirements. 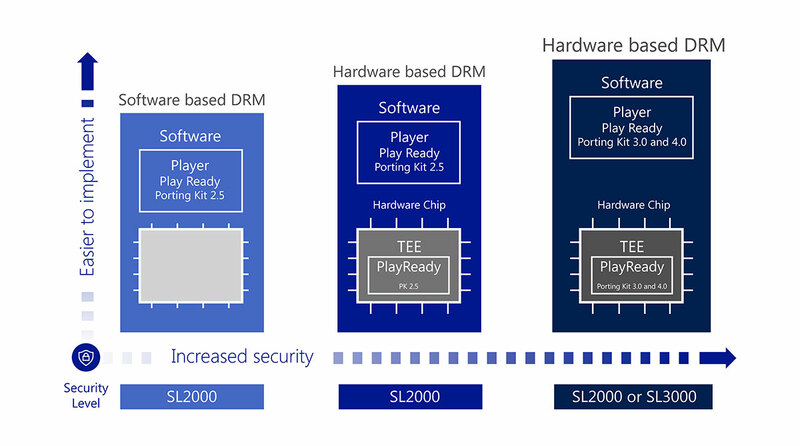 As part of the new PlayReady governance model, we have updated the PlayReady Compliance and Robustness Rules, in which we are introducing a new PlayReady Security Level 3000 (SL3000), and new requirements to the PlayReady TEE implementations to meet the hardware security requirements for PlayReady Enhanced Content Protection (ECP). This new PlayReady SL3000 is designed to be sufficient to meet the security standards for a wide range of content producers, including premium Hollywood content. To learn more about PlayReady Security Levels, visit our technical pages. The PlayReady SL3000 Playbook outlines the end-to-end process for a PlayReady Intermediate or Final Product Licensee developing or distributing an SL3000 Compliant Product. This process includes a security review of all SL3000 Conformant Intermediate Products before they can be distributed. The security review can be conducted by a third party test house or by the Intermediate Product Licensee themselves. The Playbook also includes a checklist of the requirements applicable to the Intermediate Products, in the form of a ready-to-use test report.